The Asteroid Census – Could It Save the Planet? Stephen Hawking believes that one of the major factors in the possible scarcity of intelligent life in our galaxy is the high probability of an asteroid or comet colliding with inhabited planets. We have observed, Hawking points out in Life in the Universe, the collision of a comet, Schumacher-Levi, with Jupiter, which produced a series of enormous fireballs, plumes many thousands of kilometers high, hot "bubbles" of gas in the atmosphere, and large dark "scars" on the atmosphere which had lifetimes on the order of weeks. While NASA's Wide-field Infrared Survey Explorer, or WISE, is busy surveying the landscape of the infrared sky, building up a catalog of cosmic specimens — everything from distant galaxies to "failed" stars, called brown dwarfs, closer to home, the NEOWise mission is picking out an impressive collection of asteroids and comets, most of these hang out in the Main Belt between Mars and Jupiter, but a small number are near-Earth objects — asteroids and comets with orbits that pass within about 48 million kilometers (30 million miles) of Earth's orbit. By studying a small sample of near-Earth objects, WISE will learn more about the population as a whole. How do their sizes differ, and how many objects are dark versus light. "We are taking a census of a small sample of near-Earth objects to get a better idea of how they vary," said Amy Mainzer, the principal investigator of NEOWISE, a program to catalog asteroids seen with WISE. So far, the mission has observed more than 60,000 asteroids, both Main Belt and near-Earth objects, with more than 11,000 are new previously unknown objects. "Our data pipeline is bursting with asteroids," said WISE Principal Investigator Ned Wright of UCLA. "We are discovering about a hundred a day, mostly in the Main Belt." 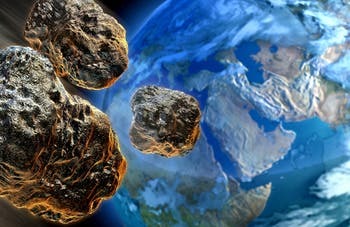 About 190 near-Earth asteroids have been observed to date, of which more than 50 are new discoveries. All asteroid observations are reported to the NASA-funded International Astronomical Union's Minor Planet Center, a clearinghouse for data on all solar system bodies at the Smithsonian Astrophysical Observatory in Cambridge, Mass. A network of ground-based telescopes follows up and confirms the WISE finds, including the NASA-funded University of Arizona Spacewatch and Catalina Sky Survey projects, both near Tucson, Ariz., and the NASA-funded Magdalena Ridge Observatory near Socorro, N.M. Some of the near-Earth asteroids detected so far are visibly dark, but it's too early to say what percentage. The team needs time to properly analyze and calibrate the data. When results are ready, they will be published in a peer-reviewed journal. WISE has not found an asteroid yet that would be too dark for detection by visible-light telescopes on the ground. "We're beginning the process of sorting through all the objects we're finding so we can learn more about their properties," said Mainzer. "How many are big or small, or light versus dark?" WISE will also study Trojans, asteroids that run along with Jupiter in its orbit around the sun and travel in two packs — one in front of and one behind the gas giant. It has seen more than 800, and by the end of the mission, should have observed about half of all 4,500 known Trojans. The results will address dueling theories about how the outer planets evolved. With its infrared vision, WISE is good at many aspects of asteroid watching. First, infrared light gives a better estimate of an asteroid's size. Imagine a light, shiny rock lying next to a bigger, dark one in the sunshine. From far away, the rocks might look about the same size. That's because they reflect about the same amount of visible sunlight. But, if you pointed an infrared camera at them, you could tell the dark one is bigger. Infrared light is related to the heat radiated from the rock itself, which, in turn, is related to its size. A second benefit of infrared is the ability to see darker asteroids. Some asteroids are blacker than coal and barely reflect any visible light. WISE can see their infrared glow. The mission isn't necessarily hunting down dark asteroids in hiding, but collecting a sample of all different types. Like a geologist collecting everything from pumice to quartz, WISE is capturing the diversity of cosmic rocks in our solar neighborhood. In the end, WISE will provide rough size and composition profiles for hundreds of near-Earth objects, about 100 to 200 of which will be new. WISE has also bagged about a dozen new comets to date, which are easy for the telescope to spot because, as the comets are warmed by the sun, gas and dust particles blow off and glow with infrared light. Many of the comets found by WISE so far are so-called long-period comets, meaning they spend billions of years circling the sun in the frigid hinterlands of our solar system, before they are shuttled into the inner, warmer parts. Others are termed short-period comets — they spend most of their lives hanging around the space near Jupiter, occasionally veering into the space closer to the terrestrial planets. WISE's measurements of these snowy dirtballs will allow scientists to study their size, composition and density. Measurements of the comets' orbits will help explain what kicks these objects out of their original, more distant orbits and in toward the sun.